We are fortunate to have a number of restaurants in Ipswich that boast extensive vegan offerings on their menus – Cosy Club being one of them. When Waterfront Life was kindly invited to visit and try out some of their vegan-friendly dishes, editor Danielle jumped at the chance to catch up with her vegan brother over a leisurely weekend brunch. Unless you’ve been hiding away from the world in 2019, you’ll know that January has taken on a foodie nickname, in honour of the growing interest in veganism in the UK. ‘Veganuary’ was born in 2014 and has successfully changed the lives of millions in the first month of each year since. Cosy Club Ipswich has offered a vegan menu (as well as a gluten-free menu) since it first opened back in 2016; with dishes ranging from full English breakfasts, to tapas, burgers and curry. On my first visit, I actually opted for the Thai Burger – a delicious quinoa-based patty with coconut sauce and chilli jam – and to this day it remains one of the best burgers I’ve ever eaten – meat or no meat! Knowing my latest visit would entail more animal-free delights, it was only right to invite my brother, Ben, along to get a proper vegan opinion. Ben had previously sampled the Vegan BLT at Cosy Club and had been a little disappointed: the ‘bacon’ used was more of a ham consistency, and was served cold, so became more of a club sandwich than BLT. So he was keen to put the same dish to the test and see if it lived up to expectations this time round. 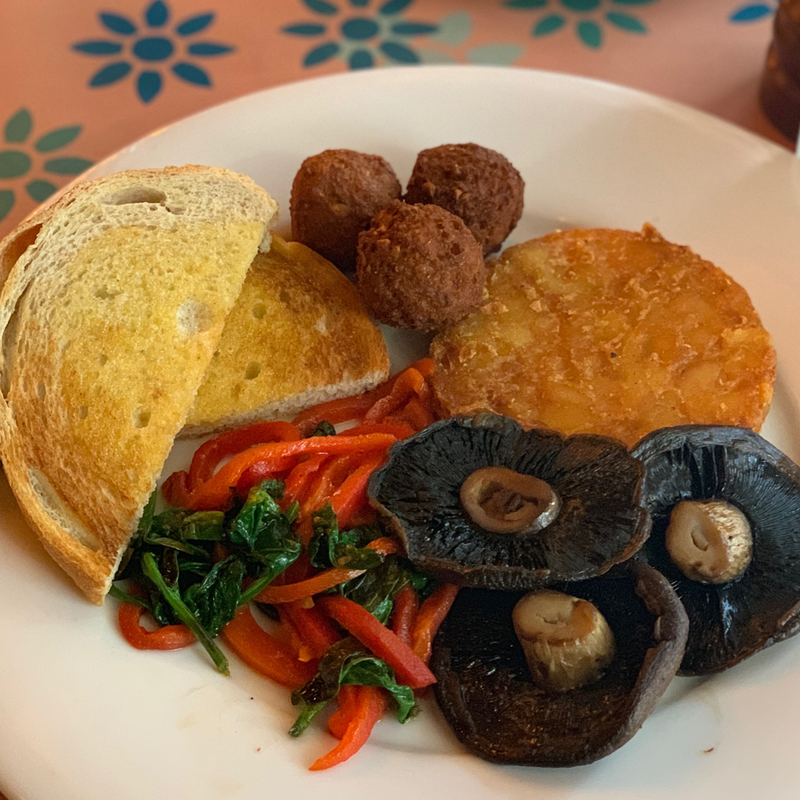 I opted for the Vegan Breakfast – falafel, grilled tomato, field mushroom, wood-roasted peppers, spinach, potato rosti and baked beans with sourdough toast. To me, a breakfast is normally only a breakfast if it includes some variation of eggs or bacon, so I was intrigued to see how this rustic mix would hit the spot. Even as a non-vegan, I don’t drink cow’s milk as I’m lactose-intolerant, so I was pleased to learn Cosy Club offers both soya and oat milk as dairy alternatives, and happily ordered a soya cappuccino to accompany. The coffee was strong, tasty and had a good froth – something a lot of baristas fail to achieve with non-dairy milks. The food was served quickly, despite it being a fairly busy time in the restaurant. The presentation of the food was clean and simple, and we were asked whether we wanted any sauces to accompany. My breakfast was hot and tasty – although a little on the dry side, as it only occurred to me whilst writing this that the baked beans were missing! It certainly could have done with something a bit more ‘saucy’ on the plate, without having to add a table sauce. I waited in anticipation of Ben’s second test of the BLT. This time round, he expected the ‘bacon’ to be served hot, however it was once again cold and ham-like so we deduced that this was how it was intended to be served. He commented that, had it been marketed as a Vegan Club Sandwich, it would be up there with one of the best he has had. But the BLT name lets it down in the ‘B’ department! Both Ben and I (and my son, who opted for a non-vegan breakfast to feed his sausage addiction!) enjoyed our brunch, and appreciated the vast array of vegan options available to a diner. The service we received during our visit was also excellent – attentive but not overbearing, and a check back at an appropriate time. Our return visit will definitely take place over dinner – I’m dying to try that vegan Thai curry now!